Heated holding of some menu items, such as chicken, leads to a greater chance of products becoming steamed or soggy. When these menu items are exposed to uncovered dry heat, they can become dry and rubbery. In order to achieve the best, balanced result, a controlled moisture environment is preferable. FWE Moisture Holding cabinets offer users absolute control over the holding process, giving the ability to create a customized environment that best suits the products being held. Models equipped with Moisture-Temp technology are designed with 'easy' in mind to hold all your moisture sensitive foods longer and safer. These high performance, low technology models are built better to assure consistent temperatures and humidity levels in order to avoid dried out food. All food products contain water. By surrounding food with a balanced humidity level at a safe holding temperature, natural moisture within food is able to be better preserved. FWE's Moisture-Temp Heat System eliminates hot and cold spots by gently circulating hot, moist air consistently throughout the interior of the cabinet. As an industry leader, FWE's moisture-temp series features separate 'air moisture' and 'air temperature' controls. 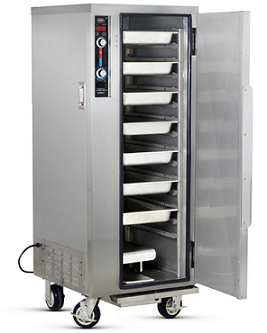 The operator can adjust for the optimum temperature and moisture of the cabinet environment to hold food at 'just-cooked' quality longer than ever before. Controls are up-front, easy to use, and allow air moisture and air temperature to be controlled individually with the turn of a dial. Recessed control panel features a full range thermometer and thermostat with a scale of 90° to 190° for temperature and levels for moisture control. All Moisture-Temp models come standard with removable industry standard, "hotel-size" 12x20" humidity pans, making them both easy to clean and easy to replace. Heat systems are built into the cabinet to reduce maintenance and cleaning costs. These models are built with you in mind. Field reversible doors come standard on all models, giving your operation flexible installation options for kitchen layout. Magnetic work flow door handles ergonomically accommodate kitchen staff and servers at varying heights. FWE provides you with a choice of cabinet sizes that can maintain food flavor, temperature, and texture. From full-size to under-counter, these cabinets are sized to fill your operations specific needs. FWE solid stainless steel welded base-frame construction is built to withstand continuous, demanding use and will outperform all other brands. Units are constructed with welded base frame for added strength and durability. The fully insulated cabinet and door provides energy efficient heating and promotes longer holding times. Moisture-Temp models are ideal for applications where moderate control over moisture content is needed. For environments that need more precise control over moisture content, FWE's Clymate IQ will likely be a better match. To learn more about FWE's Clymate IQ models, visit www.fwe.com/learn/An-Introduction-to-Clymate-IQ-Cabinets. To help you save money and protect the environment, FWE Offers several ENERGY STAR certified Moisture-Temp systems, to learn more and see a full list of certified models, visit www.fwe.com/energy-star. FWE offers a variety of features and options for our Moisture-Temp models, to learn specifics, see literature, additional photos and get a quote, visit www.fwe.com/products/moisture-holding. If you are interested in speaking to a sales representative about this product of other that FWE offers, please contact sales@fwe.com.